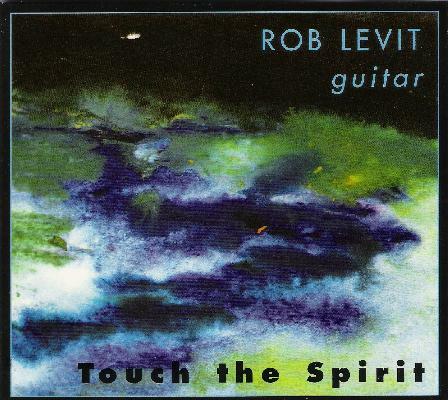 Rob Levit - "Touch the Spirit"
Looking around Rob Levit's web site it seems this Annapolis, Maryland based musician has his hands in a number of activities. In addition to his own music Levit is a writer and poet, conducts various types of music and arts workshops and is a motivational speaker. Albert reviewed Levit's Anatomy of Ecstasy in AI #29 and wasn't exactly bowled over by that electronics dominated 2-CD set. But on Touch the Spirit Levit returns to his primary instrument, the guitar, offering up 24 tracks of acoustic guitar dominated music. The CD opens with the title track, and it's immediately apparent that Levit is a master of his instrument. Steady melodic phrases and fiery runs are backed by a chanting meditational drone. Meditational is a word that characterizes much of the aptly titled Touch the Spirit. No, it's not New Age music. Some of the tracks are a bit on the fluffy side. But there are many beautiful and inspiring pieces of music that feature hot guitar playing, with lots of intricate stylistic twists and turns. Levit is clearly an accomplished jazz musician, though while much of the music could be said to be jazz based I wouldn't classify this as a jazz album. Michael Hedges comes to mind, and Levit is obviously in that league as a musician. But overall this album is about pleasant, interesting and often mind blowing guitar music and even a few tracks that border on the avant-garde. If any one track really stood out for me it's "The Borderland", which is like a cosmic cross between David Torn and Robert Fripp. Ripping atmospheric spaced out world music. Lots of variety on this album. Hot stuff indeed.